The onslaught of modernity has never been more visible than in the utensil-making industry of Jandiala Guru, a town located on the Amritsar-Jalandhar road. The industry that once flourished has now almost disappeared. As per the District Gazetteer, Jandiala Guru was founded by Jats and it was named after Jand, the son of the founder. Previously, it was surrounded by a mud wall and had seven gates. “A ‘Crorepati’ at 22 years of age and only short of a few lakhs!” laughed, teased and celebrated the friends, family and relatives of Pankaj Duggal, who became the first boy in Punjab to reach the hot seat of “Kaun Banega Crorepati Part-2”. Springdale Senior School recently released a book, a CD and a booklet on the Holy City to celebrate its silver jubilee. The school has been achieving excellence in academics, sports, extracurricular activities, Indo-Pak peace initiatives, revival of traditional arts, cultural integration, rural development and social sensitisation for a holistic approach to education, said Ms Manveen Sandhu, the school’s principal. 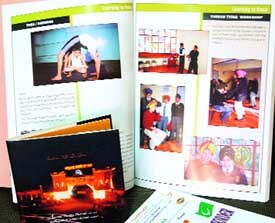 School souvenir released during the silver jubilee ceremony. Laughter is the best medicine and helps a person to live longer and stress free. But in today’s fast-paced life, people have perhaps forgotten to laugh, says Mr Pritpal Singh, who has three books of jokes to his credit. Prolific writer Dr K. S. Kaang has been conferred a fellowship of the prestigious Punjabi Sahit Sabha, New Delhi. Earlier this year, he was nominated for the Shiromani Punjabi Lekhak Award by Punjab government. He would receive the award next month. Dr Kaang has enriched literature with 77 books, which include Sahitya Chintan, Badlan De Rang, Pathar Leekan and Sahitya Meemansa. His 77th book was “Punjabi Novel Te Novelkar”. 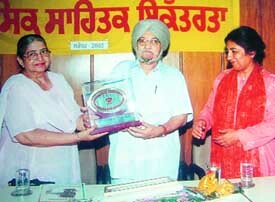 Dr Ranuka Singh, Chairperson, Punjabi Sahit Sabha, and Dr Mohinder Kaur Gill, Gen Secretary honour Dr K.S. Kaang. In a unique initiative on the International Day for the Elderly, which fell on October 1, the Fortis Hospital here launched the Golden Age Club for senior citizens, bringing to them world-class healthcare facilities. “What Durga Puja is to West Bengal and Dandiya celebration is to Gujarat, the Langoorwala Mela is to the Holy City of Amritsar. Every year on the occasion of the Navratras, thousands from across the country and abroad arrive at the ancient “Bara Hanuman Prachin Mandir” at Durgiana Temple here to take part in the internationally famous nine-day Langoorwala Mela. This year the mela starts from October 4. Time to dress up: Children in langoor costume at the Langoorwala Mela. They are ready to play peace. About 15 children from Pakistan were in the Holy City to perform in ‘Border-Border’— a play organised under the aegis of Punarjot (a centre for preservation and promotion of the heritage in Punjab) and the Lahore-based Ajoka Theater. The play was hosted at the Springdale Senior School here. An inter-school quiz contest on the life of Mahatma Gandhi was organised by the Jallianwala Bagh National Memorial Trust, Gandhi Samriti and Darshan Samriti, New Delhi. Holy Heart Presidency School won the contest. 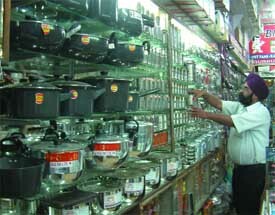 Modern utensils have edged out traditional ones at most shops in the Bhandyawala Bazaar in the city. Punjab has been the treasure house of distinctively artistic traditional utensils. The dawn of the 21st century, however, brought the bad news that the glittering elegance of the traditional utensils of Punjab had started losing its sheen in the small industrial units of the historic town of Jandiala Guru. Floral fruit bowls, embossed dinner sets and utensils with antique designs, all are finding their way into the furnaces of Jandiala Guru. Though the purported aim of this is to give life to things that might otherwise end up in a trashcan, the fact remains that old-fashioned utensils are fast disappearing into furnaces. Hardly anyone is bothered about the preservation of these utensils, which should have been kept in museums as relics of the past. Foreigners, who throng the Holy City, find it surprising that the famed traditional utensils of Punjab can neither be seen in museums nor in markets. The exquisite craftsmanship, which was a matter of lifestyle and elegance, has vanished from Amritsar that used to be north India’s biggest utensil market, rues an old-timer. The tradition of buying utensils (the heavier, the better!) used to be an investment which continued till the last century. But the latest trend is towards modern utensils or crockery. The richly-ornamental and stylish utensils seem to have become things of the past. The traditional utensils are usually full of elaborate adornments. The urban people, however, prefer adornments which are more refined and delicately crafted in brass-coated stainless steel. These days, various techniques like filigree, embossing and enamelling are used to add to the sophistication. At that time, Amritsar had emerged as the biggest utensil-making city due to strategic and geographical reasons. Two out of five units sanctioned by the then British government in 1928 were set up here. The rest three units were allotted to Jagadhri, Rewari and Lyallpur. The famous M/S Balli Singh and Bhgwan Singh continued to manufacture utensils on a mass scale till 1985. Mr Jayant Sud, grandson of late Bhagwan Singh, said his family had been in the trade for the past two centuries. Before 1928, his ancestors used to get kitchenware prepared manually. However, for setting up the mill, they had imported the machine from England. He said the family had exported utensils to Yarkand through the Kashmir route, but after the 1917 Russian Revolution, the route was closed down. He informed that kitchenware used to be manufactured from copper, aluminum, brass and stainless steel. The production of stainless steel was started in the early 1960s. For this, sheets used to be imported from Japan. He said they had to abandon their ancestral business and shut down the mill as children of all partners had become highly qualified and were well settled in their chosen fields. 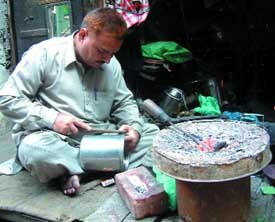 Vestiges of small utensil-making units can be seen at the Kesarianwala Bazaar, located inside the walled city, and near the famous Guru Bazaar here. Artisans hammering foils of brass and copper to give them a new shape is, however, a rare sight in such bazaars now. This sight draws the attention of foreigners keen to see the old city and its activities spread in the periphery of the Golden Temple. Mr Vijay, an artisan, says, “The foreigners immediately click our photographs and enquire about the goods.” He informs that the ancient art is now on the verge of extinction. Earlier, hundreds of families were in the profession, but presently about fifteen shops were left in the area, which once used to be abuzz with the striking sound of hammers. Though the old generation of thathiars (artisans who manufacture utensils manually) is fast disappearing, the presence of a young artisan Sonu, 27, is a ray of hope that the young generation may help in keeping this age-old art alive. However, Sonu said that the art of thathiara could not be preserved for long unless the government came to their rescue. He said the new generation was not ready to join the occupation as it was not monetarily lucrative. He added that the traditional utensils were prepared “on order” as there were very few takers for them. “Our work has now merely been reduced to repairing old wares,” he rued. Next to the Kesarianwala Bazaar is the Bhandianwala Bazaar (kitchenware market). All shops in this market have stainless steel and modern kitchenware. Goods here come from Mumbai and Jagadhri. The famous Muradabadi wares have now been reduced to showpieces. Jandiala Guru has the distinction of having two working bhathis (furnaces). The bhathis and a few shops here are situated in the Thatheriyanwala Bazaar. The owner of one of the bhathis, Mr Brij Lal Malhotra, said his father Harnam Das Malhotra, and one Jagat Singh Malhotra both had migrated to the city from Gujjaranwala (Pakistan) and set up the factories here. He said the area was famous for its kitchenware. But since the advent of stainless steel, the age-old art of manually preparing utensils from copper, aluminum and brass had been neglected. He said these days they melted the scrap of various metals and moulded it as per the orders received. “We run our bhathis on select days only. Sometimes, we get the scrap that is barely sufficient to run the bhathi once in a month. Most of the artisans have joined other professions to earn their livelihood,” he added. On learning that old utensils having heritage value were being melted, some teachers of the local Guru Nanak Dev University took up the case. Their visit revealed that valuable artifacts and wares would have been thrown into the bhathi for recycling had they not intervened. They salvaged the items and placed them in the museum of the university. As per the District Gazetteer, Jandiala Guru was founded by Jats and it was named after Jand, the son of the founder. Previously, it was surrounded by a mud wall and had seven gates. 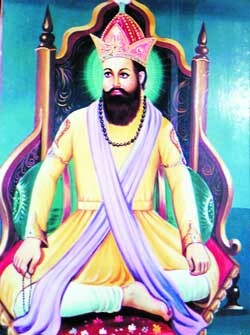 In 1767, Jandiala Guru was invaded by Charat Singh, the grandfather of Maharaja Ranjit Singh, to punish the Niranjania Guru, who had submitted to Ahmad Shah Abdali, and hence had incurred the displeasure of the people. There is a gurdwara in the memory of Baba Handal. Another gurdwara has been raised at the place where Baba Handal was born. Baba Handal belonged to a Jat family. While grazing cattle at green spaces of Jandiala Guru, he used to get spiritual lessons from a Nath Jogi living in a temple situated near the present Gurdwara of Baba Handal. The sudden disappearance of the Nath Jogis from that place one day made Handal extremely distressed. He went to Amritsar and started meditation on the edge of the tank of the Harmandar Sahib. His parents beseeched Guru Arjun Dev to persuade Handal to return home. However, at the Guru’s insistence, Handal promised to return home after 12 years. All through this period, Handal remained engaged in meditation and finally met the Nath Jogi. Thereafter, Handal founded the Niranjania sect. It stands for the oneness of God. This sect has composed its own ardas in the memory of Baba Handal. A gurdwara and a tank have been built at Nathan da Dera, where Handal had received spiritual lessons from the Nath Jogi. The documentation of the valiant acts of the Sikhs who had helped the Europeans at the time of grave crisis has been duly recognised in Europe. The documentation, hitherto unknown information about the world wars, may compel the government of France to review the ban on wearing turban or patka in its schools. The official communications of the European countries have become a permanent record for the Sikhs who can now raise the “turban issue” with France in an appropriate and logical way. The documentation runs into 274 pages. It includes rare pictures of the brave Sikh soldiers being greeted by the Europeans. The entry of the Sikh battalion had turned the World War I in favour of Europeans who have been remembering them by organising special functions every year to mark their respective Independence Days. Dr Harjinder Singh Dilgir, a Sikh scholar, says that the unique work, including rare and precious documents, newspaper clippings of the World War period, done by Mr Bhupinder Singh deserves special commendation. The rare pictures include the arrival of Sikh soldiers in Marseilles (Oct 1914), Sikh soldiers in trenches of France, Indian troops evacuating wounded Somme. These pictures have been collected with great efforts. A letter sent to Gen Pervez Musharraf by Mayor of Leper through Mr Bhupinder Singh shows the faith entrusted in the Sikhs. The Mayor of Leper wrote to Gen Musharraf that a historical bond existed between Europe and the people of Pakistan (a part of Indian sub-continent before 1947) who had made supreme sacrifices for the independence of European countries. Mr Bhupinder Singh told Amritsar Plus that he had recorded the names and addresses of more than 80,000 Sikhs who had sacrificed their lives for the sake of European countries. However, the number of such brave soldiers was much more than that shown by the recorded history. Due recognition had not been given to such soldiers so far. He said had the sacrifices of Sikh soldiers during the world wars been projected properly, the turban issue would have been resolved by now. “I came to Holland in August 1973 and met the maharaja in September at his residence where I also met Joginder Singh Mann, Ganga Singh Dhillon and R.S. Gentle. I came to know only from him that one Balbir Singh of Delhi had been running an Indian restaurant Tandoor in Amsterdam for some years. He also told me that a Sikh family of Beant Singh-Tarlochan Singh had been living in Rotterdam for the last ten years,” he adds. Elaborating further, he says, “Our next meeting took place at the Tandoor restaurant where Bishan Singh Samundari (former Principal of Khalsa College and Vice-Chancellor of Guru Nanak University), was also with us. Mr Balbir Singh told us that there was one Guru Ramdas Ashram run by American Sikhs who also had a restaurant called the Golden Temple. This was the information which I got about the community on my arrival”. “I cultivated regular contacts with the maharaja. He was not very happy to be there as an ambassador to Holland. He would often say that he himself had handed over the Patiala state to the government in order to consolidate India, and that the tall and brave Sikh soldiers of Patiala had died in the Indo-China war fighting in the forefront. He found it difficult to understand why a Sikh was not made an ambassador to the USA, Canada or England. Tears often welled in his eyes while talking about the young soldiers. He was also unhappy over the curtailment of the privy purses. He breathed his last in May 1974 at Wassenaar. His daughter and son-in-law came from England. With his death, a brilliant star of the Sikhs had disappeared from the firmament of Holland,” he adds. Pankaj Duggal receives his cheque from Amitabh Bachchan. An MBA student at Guru Nanak University, Pankaj won Rs 6.40 lakh in the hit TV series hosted by Bollywood superstar Amitabh Bachchan. Jubilant and thrilled over his performance in the programme, which was telecast on October 2, the Amritsar boy is now eagerly waiting to watch the carry-forward episode on Friday, October 7. “I used to dial the number at least 20-25 times a day until I got it for episode number 27 and handed over the phone to Pankaj Bhaiya, as being a minor, I was ineligible as minor to participate, ” says Sachin with a cute smile. “After three phone calls and the same number of questions, my happiest moment came on August 9 when my selection was finalised and later on August 28, I received two Indian airlines tickets to New Delhi. My father, Mr Kasturi Lal Duggal, a commission agent in grain market, accompanied me,” he said. How did it feel to sit on the KBC hot seat? “I was nervous in front of a great personality like Mr Amitabh but amazingly my host made me feel so comfortable. Besides, Mr Siddharth Basu, the famous quiz master, also helped us prepare ourselves for the programme. Yes, off and on I did get confused and I used ‘Lifelines’ and thankfully these proved to be fruitful. I am proud to say that on a query about my knowledge bank, I replied that I read ‘The Tribune’ newspaper daily”. Asked how he would use his money? “On studies! Both for my younger brother and my own self,” Pankaj replied. The school has also evolved a special wing of “Puranjot” under which the first ever Indo-Pak joint play “Border Border” was performed. Besides this, the school has conducted heritage studies on villages of Kishankot, Amritsar, Hamira, Jaisalmer (Rajasthan), set up computer education centre in village Narli — the ancestral village of Bhagat Puran Singh and created the museum of Bhai Ram Singh (a renowned architect) in Cheel Mandi. The students here also contribute to the local theatre group “Naatshala” and the school has even adopted the Citizen’s Forum Vidya Mandir School for wards of drug addicts, said the principal. Supporting SPICMACAY (Society for Promotion of Culture, Music, Arts among Youth), the school has held various workshops over the years in photography, painting exhibition, doll theatre, puppetry, mime, tie & dye, creative writing, traditional crafts, calligraphy, sculpture, pottery, instrument/ dance, cooking /kitchen techniques, yoga, turban tying, career guidance by Usha Albuquerque, performances by Rafi Peer and Ajoka theatres of Lahore. In sports too, the school is grooming 26 hockey players under an Olympian. The staff and students here have represented national conventions of SPICMACAY at Pune, Kolkata, and Mumbai. Apart from this, the students have participated in mock United Nations session at the PHD Chamber of Commerce at New Delhi. Its student, Sahiljit Singh Sandhu participated in Future World Leader Summit-04 in Washington along with kids from 41 countries. Swapandeep Singh of the school won gold medal in a competition at the University of New South Wales and Garima Arora did the school proud by winning the international best child artist by Wonder Art World in Hyderabad. The school boasts of national level teams in cricket, basketball, yoga, table tennis, skating, judo, softball and swimming. A sales officer in the Press Publication Department of Guru Nanak Dev University, he is good at singing also and has been performing kirtan and gurbani sangeet. His three books include Aao hassiye, Hasso te hassao and Hassna te hasauna, all published by the Singh Brothers publications. He said lack of humorous literature in Punjabi language inspired him to write jokes in the regional language. Cartooning is one of the important parts of his books. His book Aao hassiye was released in 2003, while Hasso te hassao was released in 2004. With these three books, he has created his own place in Punjabi literature. Mr Pritpal Singh said that in today’s materialistic world people were running after money blindly. Sharing jokes had become a thing of past, he added. He said if people felt relaxed and stress free for a while after reading his books, he would consider his efforts at writing successful. Prolific writer Dr K. S. Kaang has been conferred a fellowship of the prestigious Punjabi Sahit Sabha, New Delhi. Earlier this year, he was nominated for the Shiromani Punjabi Lekhak Award by Punjab government. He would receive the award next month. Dr Kaang has enriched literature with 77 books, which include Sahitya Chintan, Badlan De Rang, Pathar Leekan and Sahitya Meemansa. His 77th book was “Punjabi Novel Te Novelkar”. Considered to be a fearless critic and prolific prose writer in the Punjabi literary circles, he founded two genres of prose in Punjabi, including lyrical essays and character-sketches. His character-sketches reflect the ability to understand the personality he writes about. He is credited with writing first lyrical essays in Punjabi. The 70-year-old writer will receive Rs 2500 per month for the next three years under the new fellowship. Dr Kaang’s literary journey began when he was a teenager. He started his career by writing stories at the age of 16. Gradually, he developed a taste for criticism. After a short span of four years, he was a recognised critic, thanks to his unbiased criticism. After completing his masters in Punjabi language, he opted for the profession of a lecturer. He taught in various government colleges and universities in northern India and carried out research works on medieval Punjabi literature. He wrote comprehensively on the contemporary history of the Holy City and his collection gives readers a peep into various facets of the historic city’s life. “Yadan De Panchhi” (an autobiographical essay) is an exquisite example of this. For literary pursuit, Dr Kaang has visited Germany, Holland, Denmark, Luxemburg, Thailand, Singapore and Pakistan. Extensive travel has enriched his writings and provided him with a rich experience that is visible in his writings. The septuagenarian also writes in English. His three books — Principal Teja Singh, Bawa Balwant and Sujan Singh — are already available in the market. In his literary career, he has compiled Punjabi-English dictionary and his 15 entries has been included in the “Encyclopaedia of the Indian Literature” published by the Sahitya Akademi. Since his retirement in 1994, he has been devoting his time to literary pursuit. A bypass surgery and other old-age complications never became an obstacle. 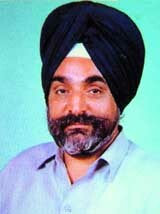 Presently, he is busy writing biographies of Shaheed Bhagat Singh and late Col Narinder Pal, a noted Punjabi writer. Membership of the club is available to Amritsaris aged 65 years or above. No membership fee would be charged. The members will be entitled to free consultations across a wide range of specialties including dentistry, dermatology, ENT, gastroenterology, general surgery, gynecology, internal medicine, neurology, ophthalmology, orthopedics and urology, six days a week. The hospital, he said, had deputed specially trained doctors, nurses and other staff. As many as 2000 langoor costumes have already been distributed by the temple authorities. Many childless devotees, irrespective of religion, don the garb of langoor to seek Lord Hanuman’s blessings for the birth of a child, while many children can be seen wearing the languor dress to show their gratitude towards Him. The temple has an idol of Lord Hanuman in sitting position. According to the epic Ramayana, twin sons of Lord Rama – Luv and Kush (Lahore and Kasur in Pakistan were named after them, respectively) — who lived in exile with their mother, Sita Mata, captured the Ashwamedha horse let loose after “Ashwamedha Yajna” performed by Lord Rama to stake his claim over the territories where the horse set foot. Hanuman, who came to defend the horse, was taken prisoner by the twins and tied to a banyan tree. Later, a temple was built at this place. To commemorate this, couples still tie a red thread on this ancient tree. 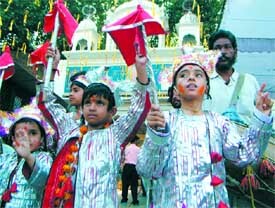 In bright red outfits, with silver and golden trimmings, conical caps, faces smeared with fuller’s earth and make up like langoors complete with long tails and silver-coloured staffs, children dressed as langoors dance to drum beats for all nine days of Navratras. Interestingly, an eighty-year-old and a few months old baby can be seen dressed as langoors to fulfill the vows of their parents or grandparents. On their part, the parents or the devotees, sleep on floor, observe fast, avoid footwear, eat vegetarian food uncut with knife and recite verses from Ramayana during the entire period. 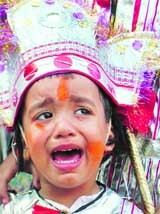 The mela concludes with Dussehra festival when “langoors” finally take off their langoor outfits near the banyan tree. The childless mothers gifted with a child untie the thread on the ancient tree only on the fulfillment of their wish. According to a popular legend, the unique festival has been celebrated for centuries. She said the children have come in direct contact with their Indian partners and realise that Indian kids are hardly different from them: sharing similar interests, aspirations and culture. In the play, children from India and Pakistan meeting at the border find that they not only share similar names but also idolise the same heroes and heroines. The sequences of the play, right from the prejudices of the people to the children crossing over the border, the political efforts like Samjhauta Express and introduction of bus services, are dotted with funny yet meaningful songs composed by Mohammad Aslam. Directed by Ms Harinder Sandhu and Mr Naseem Abbas, the play is written by Mr Shahid Nadeem. An inter-school quiz contest on the life of Mahatma Gandhi was organised by the Jallianwala Bagh National Memorial Trust, Gandhi Samriti and Darshan Samriti, New Delhi. Holy Heart Presidency School won the contest. Anuj Jamwal and Rajan Sharma of the school won the prestigious Satyagraha Rolling Trophy. Dr Rajkumar, Chief Guest on the occasion, announced Rs 31,000 for the winning team. Surbhi Mahajan and Palak Puri of Bhavan’s S L Public School bagged the second prize winning Rs 21,000 while Kiradeep Kaur and Cheena Talwar of Holy Heart School bagged the third prize bagging Rs 11,000. Mr Jugal Kishore Sharma, chairman of the Improvement Trust has told the Joint Welfare Forum Ranjit Avenue that the 200-metre long kaccha road from MK Hotel to Gumtala Bypass would be metalled soon. Dr Arvind Mahajan, President, Indian Medical Institute has been invited to the 43rd anniversary of Medicine Alternative to be held at Colombo on November 27. A Seminar on traditional Chinese medicine by Australian doctors held at the Guru Nanak Dev Hospital here. Prof Lun Wong, Principal, Academy of Traditional Chinese Medicine Clinic, was chief guest while Ms Glenys Savage, Senior practitioner at the Chinese Medicine Clinic was the main speaker.